New Hampshire was entitled to four seats in the 29th Congress (1845–1847), but only elected three representatives. Woodbury did not receive the necessary number of votes to be elected in the 1845 at-large election, and no winner was subsequently chosen in a special election. (See New Hampshire, 1846.) So the fourth seat remained vacant for the entire Congress. Can someone explain to me how exactly this worked? 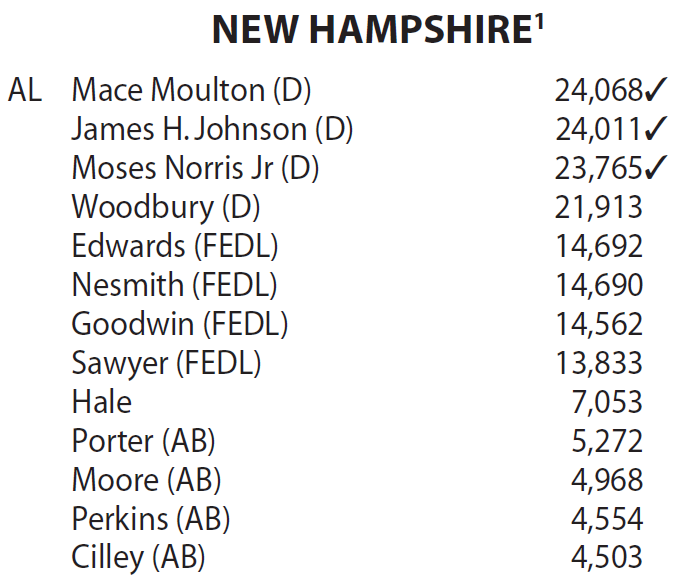 In particular, how many votes would Woodbury have needed to have been elected? It's my understanding that at the time Congressional seats were not divided up by districts, but rather everyone in the state cast votes for all seats up for election. With this being the case only 3 of the candidates running received a majority # of votes, which is required to actually win a seat. The other remaining 9 candidates spread the votes out sufficiently to prevent Woodbury from securing 51% of the vote. It's unclear why there would not be a runoff election to fill the 4th seat. Not the answer you're looking for? Browse other questions tagged united-states election congress or ask your own question. How many seats are physically on House floor? How does NOS determine invitees for electoral debates? Are there written rules regarding redactions in Congressional documents?